Here the conversation often crumbles into a series of dead-ends. A significant portion of the public has resorted to denying the scientific consensus on climate change, and there is no shortage of funding for such a campaign. Others who accept the science nevertheless become cynical from the scale of the problem; the obstacle, many conclude, is “human nature” itself. Still others, determined to fight, seek to appease large corporations with innovations that are both environmentally friendly and profitable – so-called Green capitalism. Can the profit motive save us? A new book edited by Vijay Prashad bursts through this rigid state of affairs. 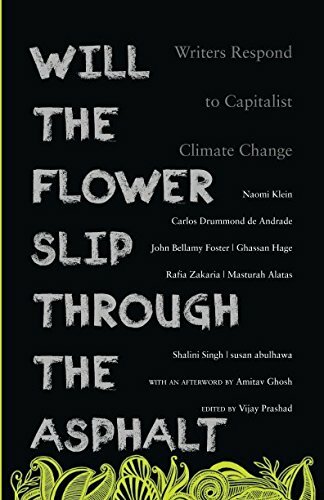 Focused around Naomi Klein’s Edward Said lecture, delivered in London on 4 May 2016, Will the Flower Slip Through the Asphalt is a short collection of narrative essays and analysis that responds to the global climate crisis in a refreshingly expansive way. Denying climate science is only the symptom of a much deeper problem that confronts the planet. It is the endemic crisis-ridden capitalism that lashes out like an injured dragon, breathing fire here and whipping its tail over there. Fatally wounded, capitalism seeks regeneration through any means – whether by seizure of precious natural recourses or the cannibalization of human labor. According to this bold diagnosis, the problem of climate change cannot be covered up by pseudo-science, dispersed through a resort to human nature, nor resolved through the alchemy of the free market: the problem is that our economic system regards both humans and nature as mere resource-inputs for the accumulation of capital. This blind and limitless consumption of natural and human resources, Prashad argues further, is not incidental to capitalism, but essential. Without this permanent ravaging of natural and social resources, capital cannot function. When human misery or social inequality and when climate change become limits, they have to be set aside. The attack on basic liberal concern for the poor (demonstrated through welfare payments and humanitarian aid) and the attack on climate science are of a piece—they are essentially attempts to conduct ideological warfare on the cultural barriers to untrammeled capitalism as preparation for the destruction of the natural and human habitat. This drive for destruction is not a function of the human heart, but a compulsion inherent in the logic of capitalism. In other words, the burning of fossil fuels does not take place in a state of nature; it takes place as an integral part of capital accumulation. Driving the point home, Prashad draws the only conclusion: “There is a powerful contradiction between the needs of a parasitic capitalism and its natural and human host”. Most analysis is said to be radical if it concludes with this point; this book begins with it. If climate change is the direct effect of fossil fuel production, and if “capitalism as a social system will be unable to transform itself from the needs of profit to the needs of society,” then climate activists have to turn their attention to our economic system itself. It is a strange relief to realize that our climate problem is much deeper than we thought. Reform will not save us. Perhaps this is not surprising, since, as Ghassan Hage remarks, “an ecological crisis is by definition something all-encompassing”. Will the Flower Slip Through the Asphalt frames our current conjuncture in this way. By showing that our environmental problems emerge not from some misty idea of human nature or individual greed but from a very historically specific mode of production, Prashad’s lead essay brings the issue of climate change, strangely enough, back down to earth. Accordingly, the essays that follow, beginning with a lecture by Naomi Klein, are rich meditations on the political economy of climate change. Contextualizing our climate crisis in the global capitalist economy allows us to see the politics of climate change unfolding in real time. The first victims of climate change, Klein reminds us, are those whose sources of food and shelter are most precarious – the world’s poor. This reality is too often overlooked in liberal discussions of climate change in favor of apocalyptic hysteria. Correcting this blindness allows us to inquire into the relationship between man-made natural disaster and other social ills – like racism and militarism, poverty and sexual violence. Klein demonstrates this by developing her concept of the “fossil fuel sacrifice zone.” Fossil fuels, she writes, “are so inherently dirty and toxic that they require sacrificial people and places: people whose lungs and bodies can be sacrificed in the coal mines, people whose land and water can be sacrificed to open-pit mining and oil spills”. It is not surprising which communities are sacrificed at the altar of fossil fuel production: always impoverished ones, overwhelmingly black and brown ones. Cutting through the liberal imagination of a looming but still distant environmental catastrophe, Klein’s essay, aptly titled “Let Them Drown,” shows how the road to disaster – the very road we are traveling – is necessarily paved with a growing viciousness in the politics of ‘othering’. We simply could not allow the motors of climate change to continue apace without a highly-developed system of othering – a division of humanity into the civilized and the backward, the accomplished and the undeserving. Racist, sexist theories which generations ago were mobilized to colonize, dispossess, and even exterminate non-Western peoples in order to settle upon and extract the wealth of the land, are now used in their refined, colorblind form to reproduce global inequalities in the ownership and consumption of the earth’s resources. Bursting the compartmentalization of different social issues, these writers push us to see imperialism and colonialism – the theft of land and its incorporation into the global market economy – as forms of ecological violence. Today we face a global climate crisis that threatens us all, but not equally, not yet. As we continue to live in a carbon economy, we do so at the expense of the world’s poor – those least responsible for the warming of the planet – as millions of workers in the United States continue to lack basic healthcare, millions in the Global South suffer from famine and drought (while, in the North, surplus produce rots), and entire island nations vanish into the rising sea. The election of Donald Trump on a platform of explicit racism, shocking to many, must be seen in this political context. Trump, from the conspicuous consumption beside abject poverty to the brazen dismissal of any scientific fact that interferes with the demands of profit-making, is the true face of global capitalism. One of his more obscene policy initiatives has been to close US borders down to millions of people fleeing war zones while intensifying airstrikes in those very same places. This is the pathology of our present global order: the precondition for our ongoing refusal to examine the roots of our problems is the sacrifice of millions, higher walls and fiercer wars. Trump is not an aberration in an otherwise just world order; he represents a seamless continuity in the growing tensions of the global economy. How can one hope in such a world? It is helpful to remember that any proposal that seeks to mitigate this crisis by incremental reforms – Green capitalism and the like – is hopeless. In an interesting reversal that characterizes our times, the pragmatic centrists (symbolized by the likes of Hillary Clinton) are now the blind utopians. Fundamental change in the structure of our economic life – away from private profits and toward addressing social needs – is the only pragmatic solution worthy of the name. This book is addressed to those that are willing to think critically about capitalist orthodoxy and creatively about social transformation. 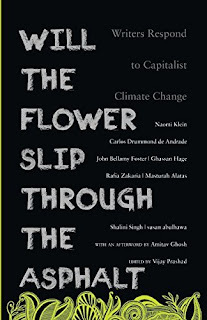 The main theoretical achievement of Will the Flower Slip Through the Asphalt is that it reveals how global climate change is organically connected to the global capitalist economy and thus to the manifold social tensions and inequalities of our world. As Klein argues, “there is no way to confront the climate crisis as a technocratic problem, in isolation. It must be seen in the context of austerity and privatization, of colonialism and militarism, and of the various systems of othering needed to sustain them all.” In other words, climate change must be seen as one aspect of capitalism’s social and ecological totality. We cannot address it without addressing institutional racism, militarism, and an economic logic that reduces human communities and natural materials to fodder for the profits of a wealthy elite. Further, these essays reveal interconnections not only between different social issues, but also between distant locales. From Standing Rock to Palestine to South Asia and the islands of the Pacific, local populations struggle for creative control over their own land and resources. These essays provide the tools to begin to view these myriad local struggles as a global struggle. If we identify the roots of our climate crisis not in excessive carbon emissions but in an economic system that makes such emissions necessary, we can liberate ourselves to envision the end of capitalism – rather than the end of the world, á la the mass-production of films depicting the coming apocalypse. What we need is to construct an alternative mode of production for the future, to be fought for on the local and global levels, which these authors show are not so different after all. A new mode of production would entail a new way of organizing society’s relationship to nature and how we transform our environment to suit our own human purposes. Perhaps a new mode of production would not mean abolishing the process of wealth creation. A socialist mode of production might seek to democratize the process of wealth creation itself, perhaps by shifting the aim of the process from private accumulation to universal livelihood. Such an economy could still foster innovation and develop dynamically. But it could also develop democratically and in accordance with social needs and ecological principles – a circular dynamism rather than a death spiral. Will the Flower Slip Through the Asphalt offers more than an uncommon theoretical clarity, however. Equally crucial is how the book shows that an alternative politics requires that we combat the vampire aesthetics of capitalism with an alternative aesthetics of our own. The writers in this book understand that ideas and numbers alone cannot combat the torrent of culture and ideology that capitalism unloads on the world. Scientific studies, charts and graphs, though essential, will not save us. Our alternative mode of production begins with a critical revolutionary aesthetics that highlights rather than hides the ecological threads binding diverse local struggles, breaking through the limits and dead-ends of contemporary ideology by recourse to personal narratives and poetic expressions that depart from the dominant structures of capitalism and cultivate flowers to slip through the asphalt. To their credit these essays never turn away from the shattering realities of climate change and the enormity of the forces that propel it – capitalism, imperialism, and the state-sponsored violence needed for the maintenance of both. Wars are powered by oil and fought for oil; whole villages are flattened to make way for global commodity chains. This is our global asphalt. But these authors show, through a robust blend of theoretical reflection and visionary yearning, how the all-encompassing nature of our global crisis, while overwhelming, is also an opportunity to build broad coalitions. It can energize us to resist the structures of global inequality in our everyday lives and make the connections to build an international movement. This book is itself a part of that burgeoning global movement, an attempt to fight the cultural death of an ailing capitalism with the generative youth of humanity’s creative powers. The essays are floral weapons for the future.